In this article, you'll learn about the relation between arrays and pointers, and use them efficiently in your program. Pointers are the variables that hold address. Not only can pointers store address of a single variable, it can also store address of cells of an array. ptr = &a;  // &a is the address of third element of a. Suppose, pointer needs to point to the fourth element of an array, that is, hold address of fourth array element in above case. Since ptr points to the third element in the above example, ptr + 1 will point to the fourth element. You may think, ptr + 1 gives you the address of next byte to the ptr. But it's not correct. This is because pointer ptr is a pointer to an int and size of int is fixed for a operating system (size of int is 4 byte of 64-bit operating system). Hence, the address between ptr and ptr + 1 differs by 4 bytes. If pointer ptr was pointer to char then, the address between ptr and ptr + 1 would have differed by 1 byte since size of a character is 1 byte. 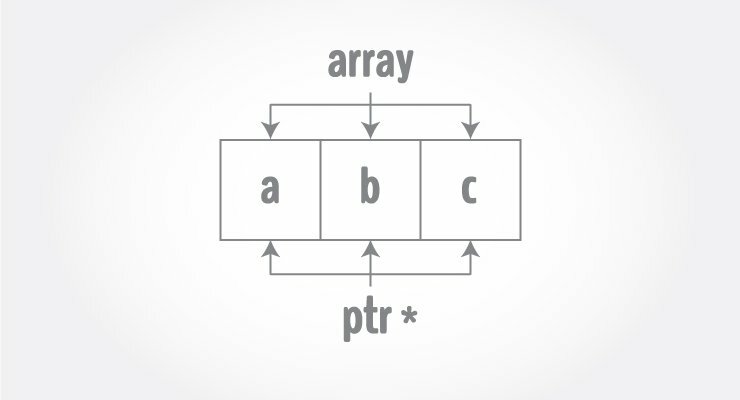 In the above program, a different pointer ptr is used for displaying the address of array elements arr. C++ Program to display address of array elements using pointer notation. You know that, pointer ptr holds the address and expression *ptr gives the value stored in the address. Similarly, you can get the value stored in the pointer ptr + 1 using *(ptr + 1). C++ Program to insert and display data entered by using pointer notation.